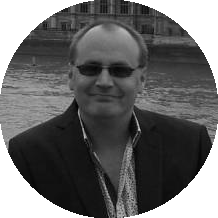 Associate Professor of Political Communication and Programme Leader, MA International Political Communication, Faculty of Media and Communication, Bournemouth University. 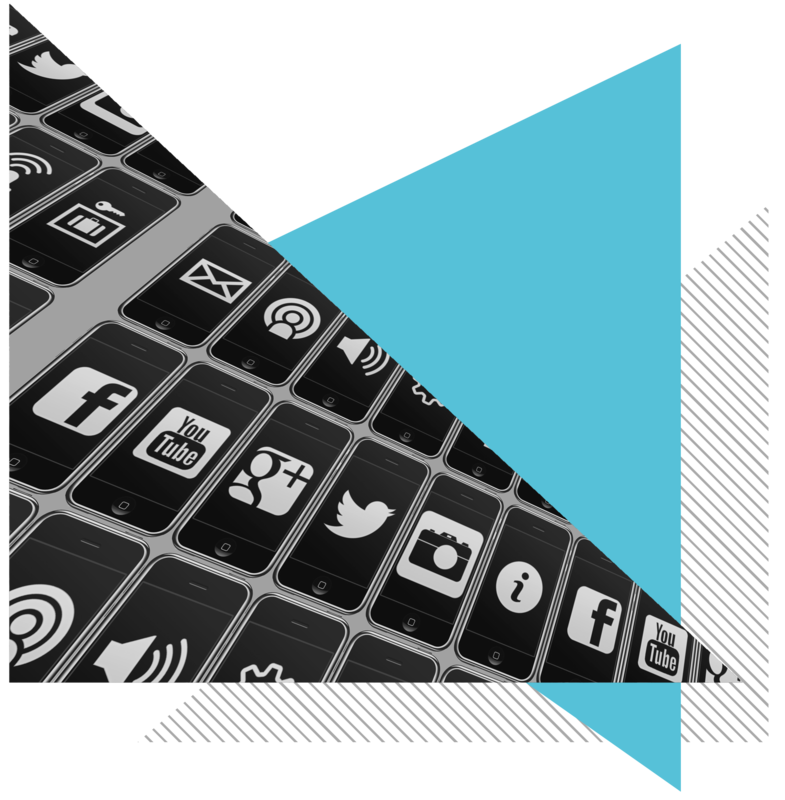 All major parties promote their social media platforms and encourage supporters to join so they can be targeted with a range of mobiliation requests. As such their social media performance represents a means to gauge how each channel was used and the reach the parties gained. The data, supplied by SoTrender (sotrender.com) provides insights into usage, audience size and audience activity which we can explore for parallels with electoral support of each party. Labour won the battle online overall, but it seems this battleground is far removed from the battle that secures electoral victory. YouTube has become a free television channel where parties upload promotional videos that can be shared within viewers’ networks. The data from YouTube (Table 1) shows the amount of videos uploaded during the campaign, number of subscribers and reach (views of main or most popular campaign video). 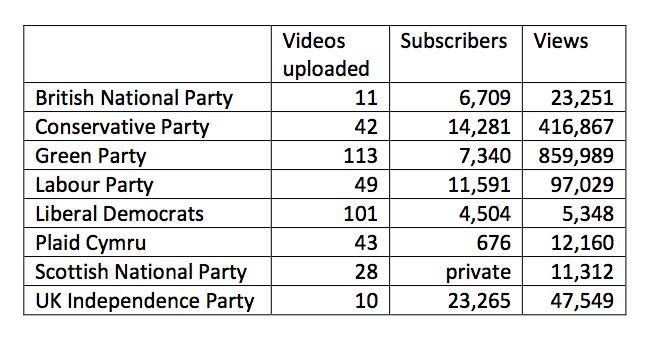 The data shows the Liberal Democrats and Green Party produced a vast amount of videos, Labour, Plaid Cymru an average amount and UK Independence Party and British National Party going for a few, clear position videos. The Greens managed to produce the single viral video of the campaign, parodying the four male party leaders (Cameron, Clegg, Farage and Miliband) as a boy band and calling for voters to ‘Change the Tune’. The Conservative’s negative ‘Its working, don’t let them wreck it’ video also gained significant popularity across the online network while Miliband’s biopic did reasonably. The other main finding is though that the Liberal Democrats struggled to gain followers or reach. Plaid Cymru, a party standing in only 40 of the 650 constituencies and courting anelectorate of 3.064 million gained more views for their campaign video despite the Liberal Democrats standing across England, Scotland and Wales. Twitter is used to push messages out and create momentum through retweets. Table 2 shows the number of tweets, follower numbers and change in follower numbers over the campaign, and an interactivity index score that shows relative levels of follower interaction (tweets x retweets) over the period of the campaign. The headlines here are that there is little overall change in followers, and most parties send around 30 tweets per day. The Liberal Democrats tweeted most but did not get the best return. Labour, UKIP and the SNP had the highest interaction suggesting they have the most engaged followers, though the Conservatives, Liberal Democrats and Greens are only slightly behind in this respect. Facebook is a key battleground, with greatest numbers of fans and a greater propensity for interactivity between followers and the party. We display data (Table 3) for number of posts, replies by the party, number of fans and change during the campaign, an interactivity index (party posts x likes, shares and comments) to indicate potential reach and the percent of engaged users (those who performed some activity within the profile during the campaign). All parties post reasonably frequently, from the verbose Labour to the more parsimonious Liberal Democrats. Replies are less frequent; the Greens and SNP excel, the Conservatives and UKIP perform poorly. Despite this, the Conservatives and UKIP have most fans, and earned the most during the campaign, but Labour, Greens and SNP all gained also. Of the national parties the Liberal Democrats perform worst. In terms of earning a highly engaged audience, we find Labour outstrip their opponents, followed by UKIP and the Greens. This data might suggest that these parties were destined for good results in the contest. Breaking down the forms of engagement, SoTrender categorises the engaged as Occasionals (lurkers who interact very rarely), Likers (who only like), Debaters (who comment only and may include trolls), Writers (who comment or publish only) and Activists (who like, share and comment and may be ambassadors). The data (Table 4) shows percentages of engaged users who fit each category. While the numbers do not differ significantly per party, the most interesting finding is that UKIP hasthe highest percentage of activists 2.75%, representing 7,025 people, their closest rival is Labour with less than half of that. If some Debaters are trolls then the Liberal Democrats would seem the biggest target, they also languish behind the major parties in gaining activists. The Scottish and Welsh Nationalists gain the least Debaters. Comparing online performance with results suggests two things. Firstly social media is only a partial microcosm of the broader electorate; here we can see the collapse in Liberal Democrat support only. Secondly it may reflect the commitment of activists, and which parties successfully mobilise, but thiscannot secure victory in itself. Despite the scale of visible support online, UKIP made a net loss in the election campaign, though the scattered support gained across the UK may be reflected online. Similarly the Green’s reach may have contributed to the increased vote share but could not overcome tactical voting and they flatlined. The conundrum is Labour. Despite their highly engaged activist base, ‘Millifandom’ (young women proclaiming love) and the ‘#JeSuisEd’ meme (pictures of ugly eating) that demonstrated connection and sympathy, the party did badly in vote share and seats. Labour won the battle online overall, but it seems this battleground is far removed from the battle that secures electoral victory.